Step 1. When you first open Outlook, it will provide a "Welcome to Outlook 2013" message, click the Next button. Step 2. The next screen will ask "Do you want to set up Outlook to connect to an email account?" choose Yes and click the Next button. Step 3. 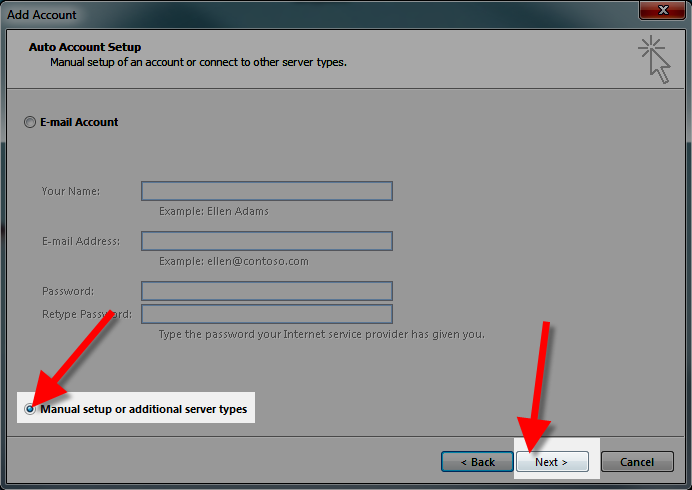 On the Auto Account Setup menu, select the option for Manual setup or additional server types, then click Next. Step 4. On the Choose Service menu, click the POP or IMAP option then click the Next button. Step 5. 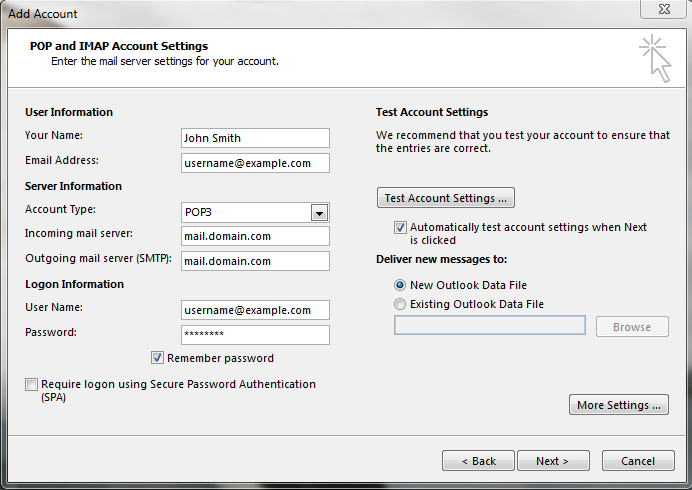 You will then see the POP and IMAP Account Settings menu, fill in the fields. Account Type Choose if you want to use POP or IMAP. 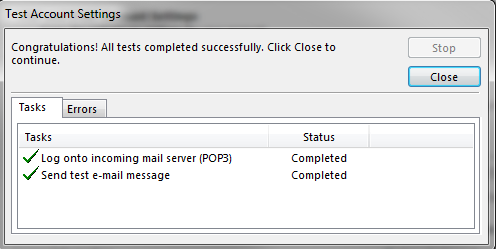 By default, POP downloads and removes your emails from the server, while IMAP leaves them on the server. Password Enter the password you for this email address. Remember password I recommend checking this box, so Outlook will save your password. Require logon using Secure Password Authentication Do not check this box. Step 6. Click the More Settings button. Step 7. Click the Outgoing Server tab. 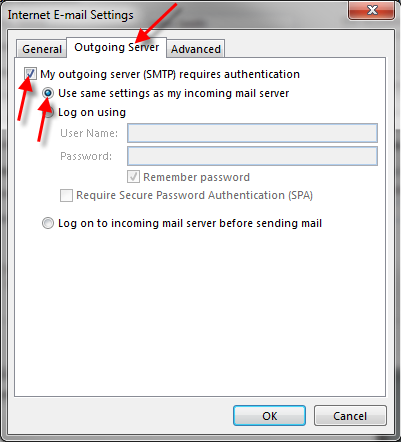 Check "My outgoing server (SMTP) requires authentication". Check "Use same settings as my incoming mail server". Step 8. Click the Advanced tab. Enter your settings, below is a description of the available options. Choose your preferred settings, below are the available options. This server requires an encrypted connection (SSL) Click this if you are using the SSL option. *Often times, ISP's will block this port for use with their email. You may want to consider using port 587, or the secure settings. Step 9. Click the OK button. Step 10. 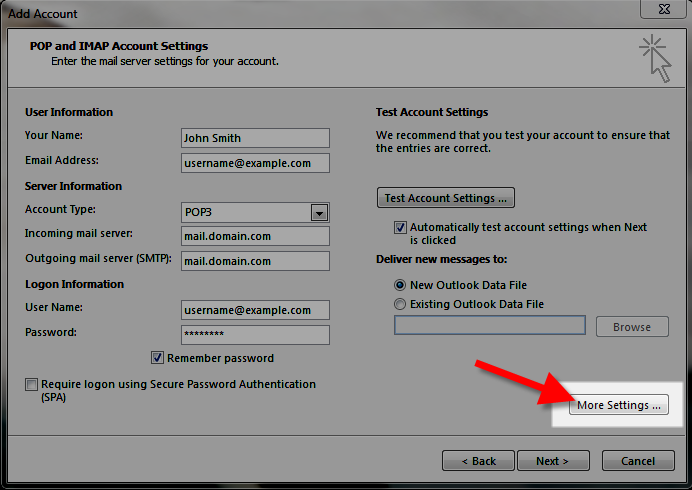 Click the Next button, Outlook will test the the account settings. Step 11. You will see two tasks: Log onto incoming mail server, and, Send test e-mail message. When they are complete, Close button. Step 12. You will see a message stating "You're all set!" click the Finish button. Copyright © 2019 J. Samuels. All Rights Reserved.